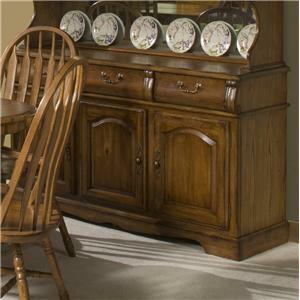 This dining buffet features three center storage drawers and two end wood framed end doors. 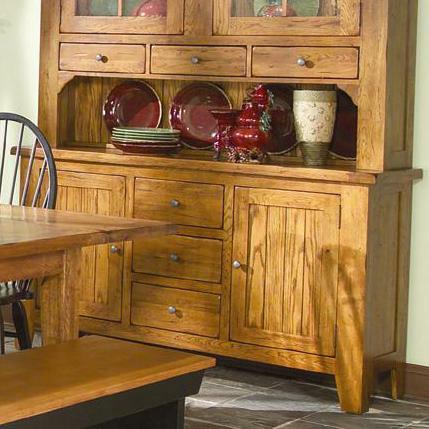 This sideboard storage unit features paneled doors and a casual rustic stain. Keep table settings, silverware, napkins and dining accessories stored in this beautiful storage cabinet. The Rustic Traditions 60 Inch 2-Door 3-Drawer Buffet by VFM Signature at Virginia Furniture Market in the Rocky Mount, Roanoke, Lynchburg, Christiansburg, Blacksburg, Virginia area. Product availability may vary. Contact us for the most current availability on this product. Drawer / Shelf Construction Solid Oak drawer fronts and English dovetailing on all drawers. All component parts feature solid oak framing with an inlaid oak veneer panel, eliminating cross grain cracking or warping. Adjustable shelves on each bookcase and base unit. Drawer Suspension File cabinets have full extension ball bearing slides. Drop-down keyboard drawer has euro slides. All other drawers have standard wood-on-wood slides.